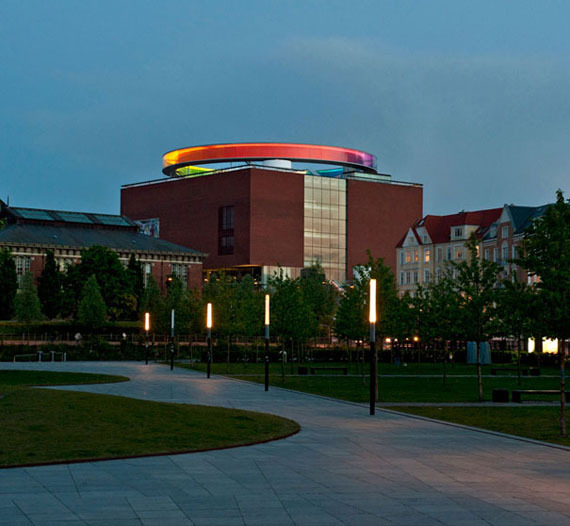 “Your Rainbow Panorama” is a Rainbow-coloured glass walkway on the roof of the Danish art museum ARoS Aarhus Kuntsmuseum, by Danish-Icelandic artist Olafur Eliasson. It’s beautiful to look at and must be wonderful to experience in person. I imagine walking through a human kaleidoscope before someone spins it around. 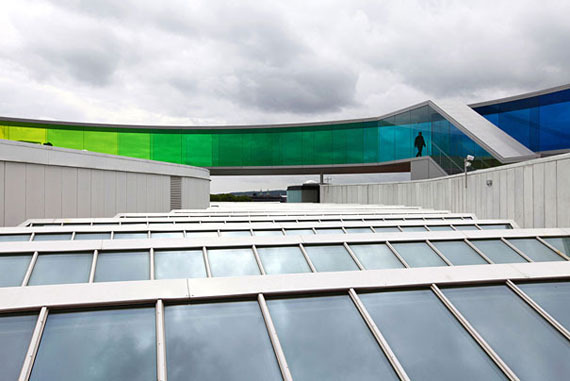 The permanent piece consists of a 150-metre-long and three-metre-wide self-contained circular walkway with glass that moves through all of the colours of the spectrum. The piece opened to the public on 28 May, 2011. 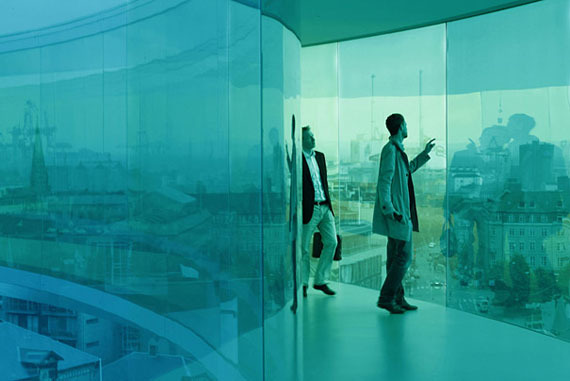 Something to check out next time you’re in Denmark. 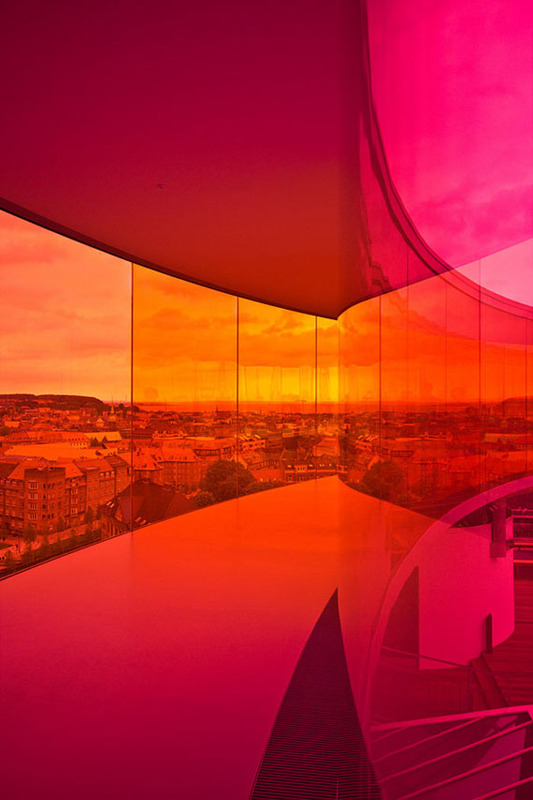 Your Rainbow panorama establishes a dialogue with the existing architecture and reinforces what was already there, that is to say the view across the city. I have created a space that can almost be said to erase the boundary between inside and outside — a place where you become a little uncertain as to whether you have stepped into a work of art or into part of the museum. This uncertainty is important to me, as it encourages people to think and sense beyond the limits within which they are accustomed to function. 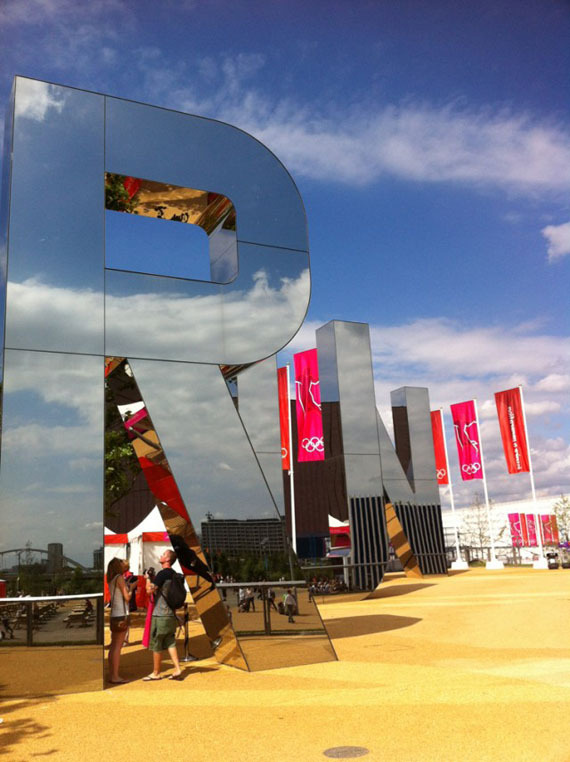 What a wonderful idea it was to support the Summer 2012 Olympics with art installations throughout London. 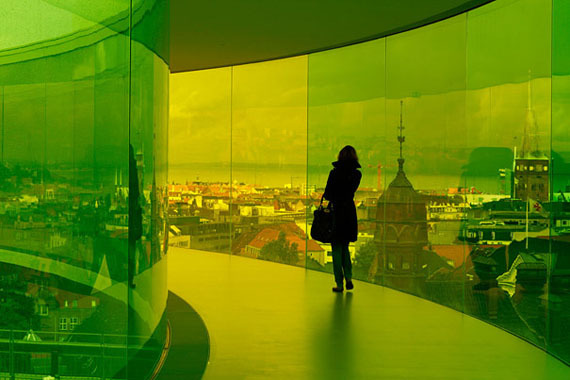 I particularly love this simple design of a mix between work and mirror, transparency and LED lighting. 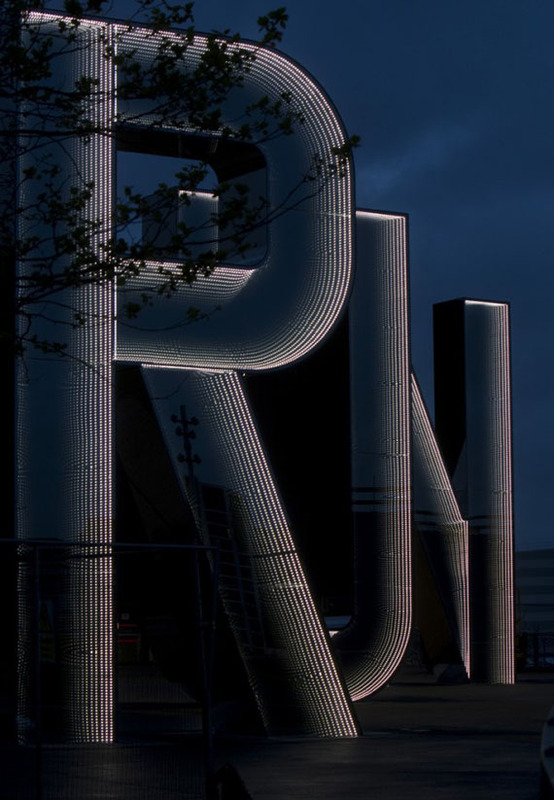 The artist is Italian artist Monica Bonvicini. 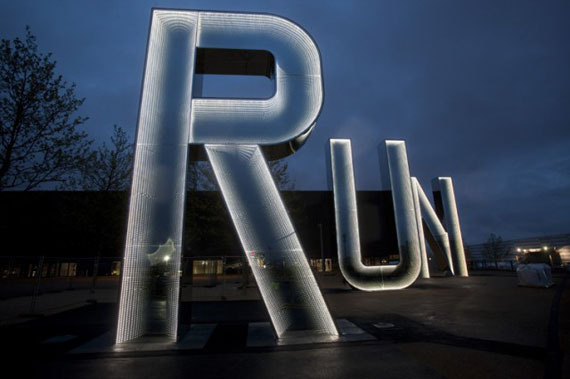 In daylight, the letters acted as a mirror for visitors and their surroundings, and at night the letters became transparent and glowed with internal LED lighting. This post is close to my heart. Being from Oakland, I’ve been watching the new monumental east span of the Bay Bridge being built up over the last 5 or so years, anxiously awaiting the day I can drive over it myself, which will all be possible at the grand opening in 2013. The west side, meanwhile, is set to have it’s 75th anniversary in 2013. In order to commemorate such a architectural accomplishment, the bridge will feature a light installation, known as The Bay Lights (to be unveiled in early 2013), by Leo Villareal. The Bay Lights from Words Pictures Ideas on Vimeo. The Bay Lights honors the Bay Bridge’s 75th Anniversary and celebrates completion of the new East Span in 2013. Created with over 25,000 energy efficient, white LED lights, it is 1.8 miles wide and 500 feet high, viewable from San Francisco and points north but not by drivers on the bridge itself. 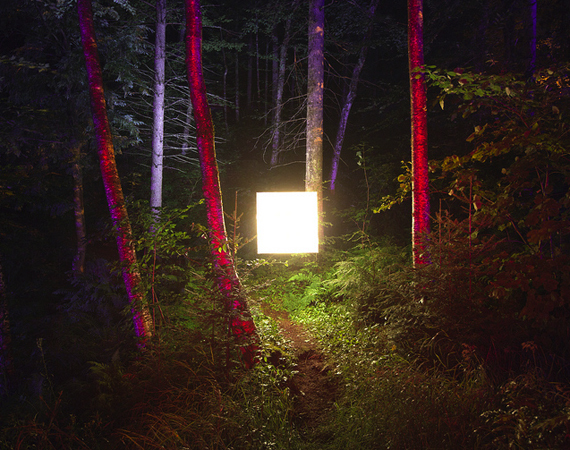 Leo Villareal orchestrates complex, rhythmic artwork composed exclusively of points of light; his groundbreaking work is part of the permanent collection of major museums worldwide. So far the project has acquired $5.5 Million dollars, with only $2.5M to go! 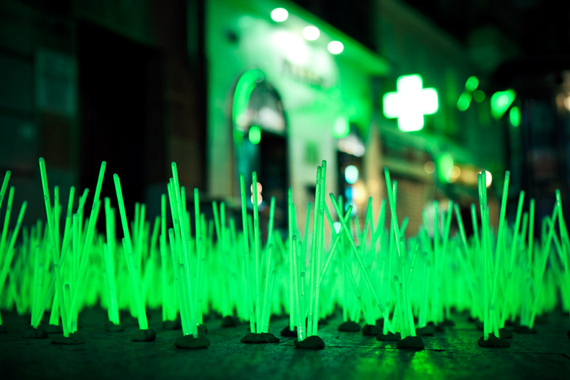 If you’d like to get involved to help make this project happen, go to The Bay Lights web site for more information. 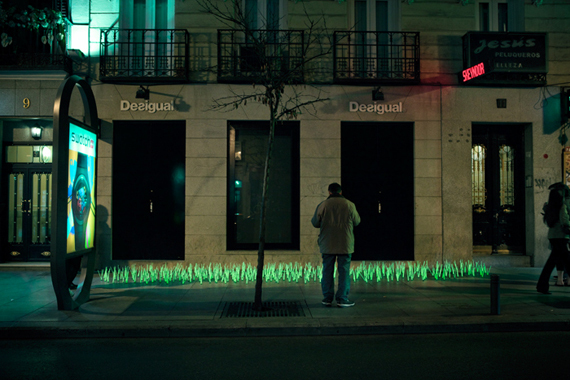 Part anti-pollution campaign, part guerilla stunt, Luzinterruptus has done it again. 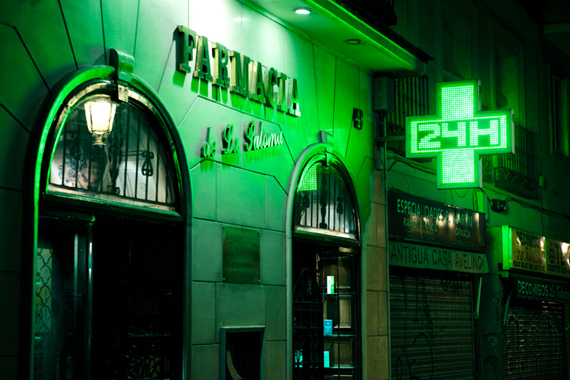 In creating Mutant Weeds, Luzinterruptus is making a statement about the fact that illuminated signs, like this pharmacy one in Madrid, are allowed to stay illuminated at all times of the night. 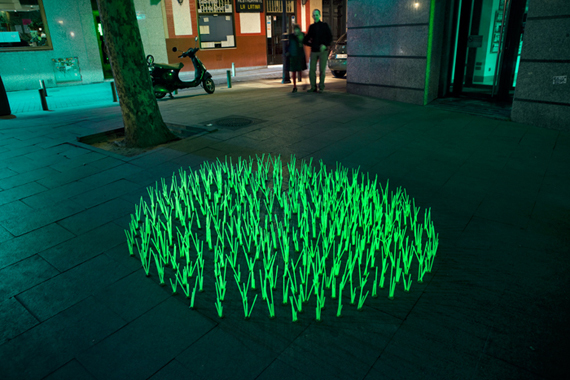 Using fluorescent sticks formed into blades of grass, Luzinterruptus planted a garden of the near future, where a new, photosensitive species grows up from the sidewalks, nourished by the lights. 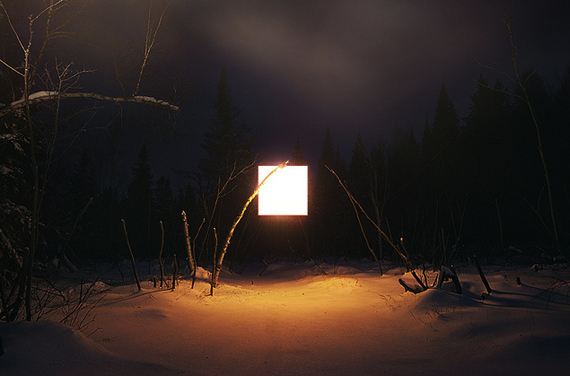 Montreal-based photographer Benoit Paillé has been staging his own series of landscapes using a different kind of lighting method involving a suspended glowing square. 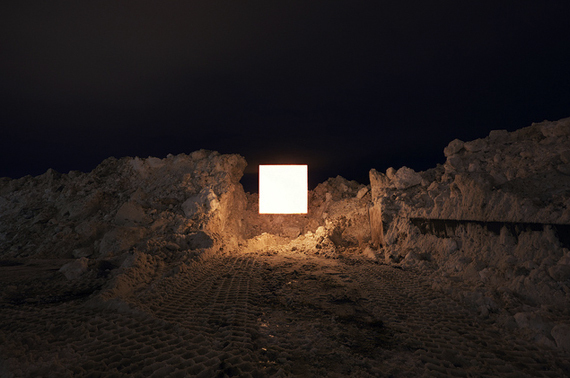 None of these images are photoshopped, the 1×1 meter light is instead hung in the center of each photograph and the resulting image shows his experiment with light illumination. 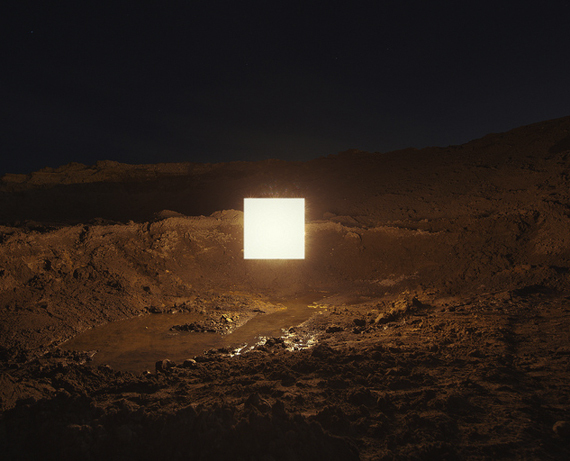 Paillé says his goal is to redefine what a landscape photograph is by questioning its reality, creating a kind of poetic moment in space and time. 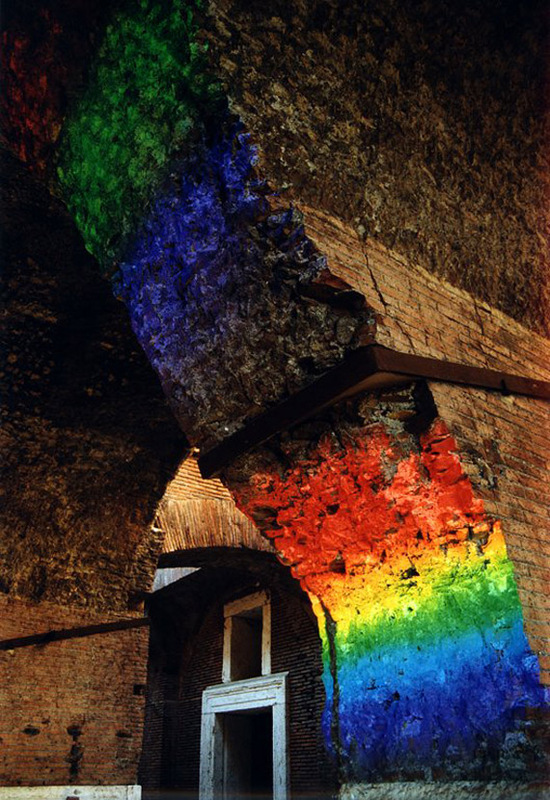 I found these great photos of a light installation by Peter Erskine. 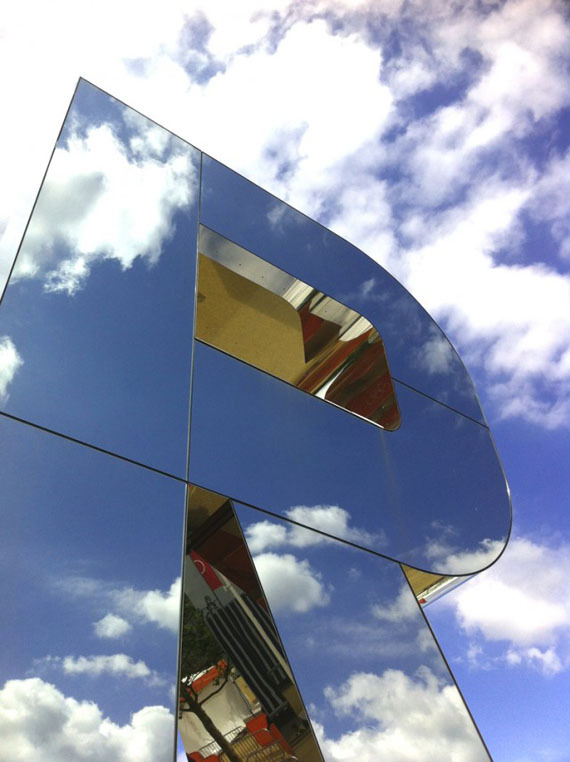 The artist’s work is firmly anchored in the architecture and context of each locality in which he is. 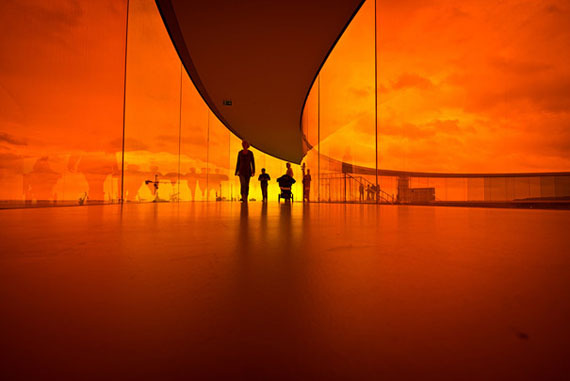 He uses sun as his source for color and subject creating illuminating displays of happiness on architecture both young and old. His technique consists of using prisms and mirrors to direct the sun at his subject. Each day and hour is a different discovery as the earth moves around the sun. 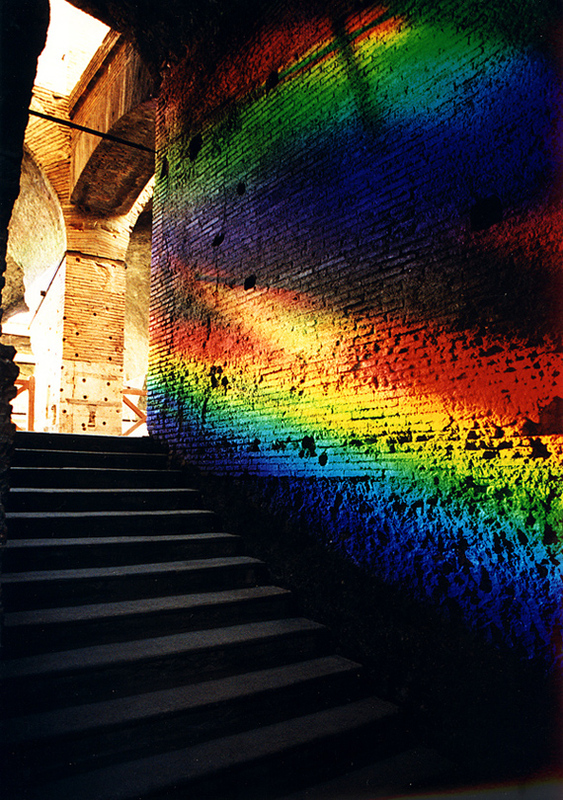 “New Light on Rome 2000″. 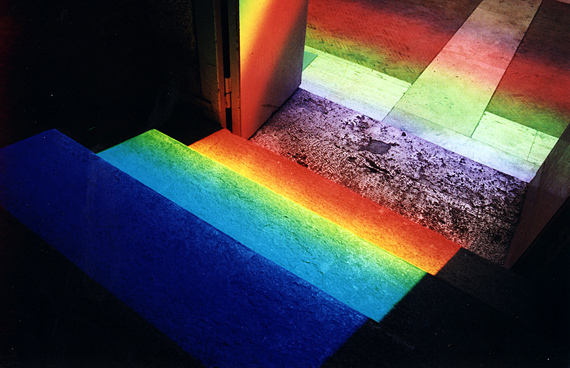 Spectrum sunlight on Aula stairs.